St. Paddy’s Day, Robin’s bad day. Ok here’s my excuse for not posting anything for St Paddy’s day, it was St Paddy’s day. But they it doesn’t mean I didn’t make anything for the special occasion. I was just, well, indisposed, for some time…a long time. So what did I want to do? Irish Stew my Funston crew loves to make? Nah. I’ve never made Corn Beef and Hash. I just know it’s very time consuming. 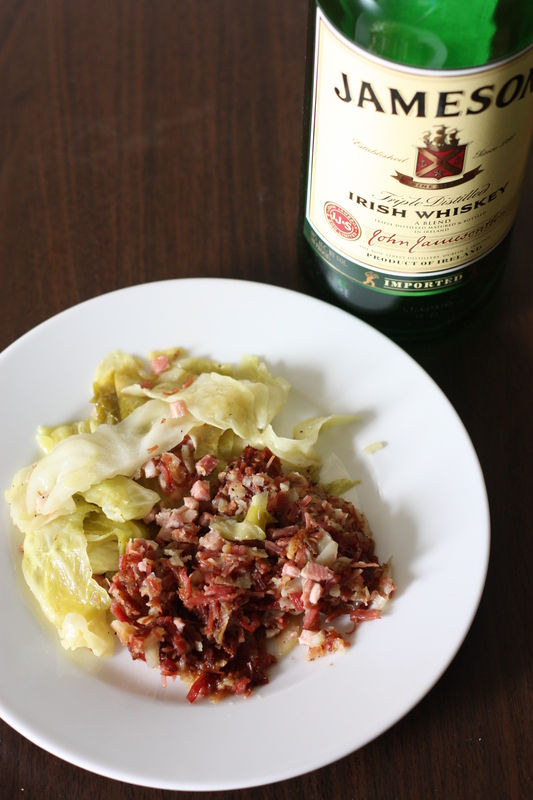 Also, my good friend Julie reminded me how good Cabbage and Bacon is. But unfortunately THERE WAS NO BACON!!!!!!!!!!!!!! The shelves at the grocery store were empty, but I knew something was wrong when there was NO BACON. So I had to try it with Pancetta. Let’s prep the brisket with a brine, which is basically salty water to break the meat down. So I had a 5 pound brisket, and I used about .75 gals of water. Throw the water in a pot (without the meat) and 1 cup of salt, 1 cup of sugar, and any combination amounts of the following brown sugar, cinnamon , mustard seed, black pepper corn, juniper berries, ginger, all spice, bay leaf, a lot of garlic, and mirepoix. I honestly have no idea how much of each I put in. Broil this l flavored water for about 30 minutes. Then let cool until it’s room temperature. When it’s cool enough, submerge the brisket in the brine, and marinade (covered) for at least 1 day. Then after a whole day of waiting, remove the brisket from the brine (dump the brine), and place in something like a pyrex dish with high sides. Place a couple of gloves of garlice, and a whole onion halves next to the brisket, and fill with water until its half way up the meat. Cover with foil, and bake at 350F for 4 hours. Ya four more hours. I’m sorry but that’s not the end of it. Fast forward 4 hours, remove the meat from the water, and let cool for 30 minutes. Then take the biggest knife you have (I have a cleaver) and start chopping that bad boy up until it’s basically minced. Now set that aside, and grate some potatoes and onions (half as much) and in a large bowl, mix the meat, potatoes, and onions. Season with whatever you want here, and throw it into a flat frying pan, like you’re making hash browns. Cook on each side for 5 or 7 minutes on medium low or until brown and crispy. Remember to flip! While the meat is going, roughly chop up cabbage and pancetta or bacon and just throw that all into a hot pan oiled with olive oil. Cook for a minute, then add 1/8 cup of water and cover and reduce to medium low heat. Super easy. And there you have it, a something that takes a lot, a lot, a lot of time investment. I’ll understand if you don’t have the time to do this. Goodness gracious I shoulda just made Irish Stew, who doesn’t like Irish Stew? Oh that’s why because lamb is SOO expensive! Hope ya’ll had a good one. 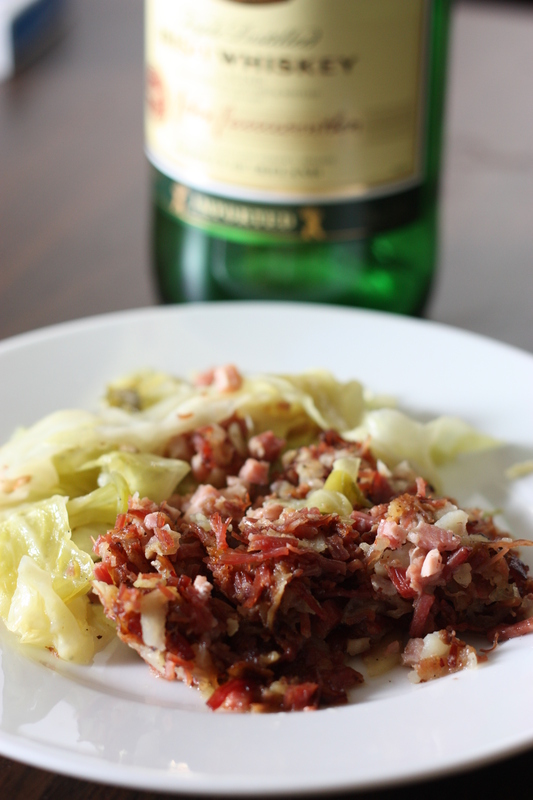 This entry was posted on March 20, 2012 by rrfoods in Dinner, Redmeat and tagged bacon, cabbage, corn beef, hash, irish, pancetta.